Self-driving cars on horizon, but how soon? Google's driverless car -- shown in 2010 -- navigates using video cameras, radar sensors, a laser range finder and detailed maps. The day when self-driven cars dominate the road, a longtime science-fiction fantasy, may not be far off, a new report says. An increasing number of drivers, most notably younger drivers, care less about the driving experience and more about getting from Point A to Point B quickly, says the report, "Self-Driving Car: The Next Revolution," which was prepared by researchers at consulting firm KPMG and the Center for Automotive Research in Ann Arbor, Michigan. As a result, they're more likely to give up the driving experience and transition to self-driving vehicles that can transport them more easily while potentially saving time and money. So, when will drivers be able to watch a movie or respond to e-mail as they drive to work? The researchers don't know, says report author Gary Silberg, the national automotive industry leader for KPMG. The report, which was released last week, doesn't pinpoint a date for when self-driving cars will become commonplace because technology has evolved so quickly, but Silberg says he's optimistic that the vehicles will be implemented sooner rather than later. "Five years or ten years from now, you and I," he says, "could have a conversation and say, 'Man, did we miss it. This thing happened.'" The report's prediction of the rise of self-driving cars is built on several key assumptions, including a sharp drop in technology costs and a highly favorable regulatory climate. Vehicles already can parallel park themselves, assist drivers when a vehicle drifts out of its lane and apply the brakes when sensors indicate a crash is imminent and the driver hasn't yet responded. Consumer demand will push the market toward self-driving cars, but some technological advances are needed before drivers widely accept the vehicles, the report says. A combination of sensors and connectivity technology, which allows vehicles to communicate with other vehicles, likely will be the most practical way to control self-driving cars, the report says. Sensor-based technology is already widespread throughout the industry, used by numerous vehicles on the road to assist drivers. Still, the cost of such systems can be prohibitive. 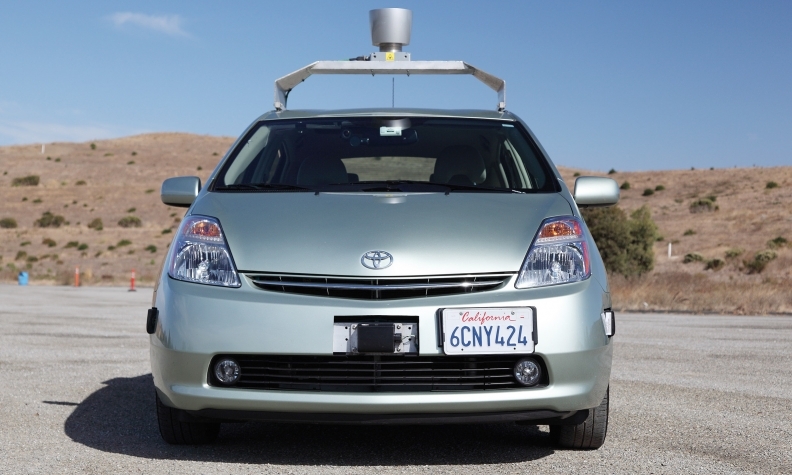 Google has created a self-driving car, for instance, but the sensor system alone in that vehicle costs $70,000. The report says those costs will need to come down in order for sensors to be a practical component in self-driving vehicles. But increased use of sensors alone isn't enough, according to the report. Vehicles also will need vehicle-to-vehicle and vehicle-to-infrastructure connectivity. Increased connectivity will give the vehicle a better sense of the surrounding environment and enable it to better react to other vehicles. It would allow a vehicle to know, for example, that a speeding ambulance is approaching at the next blind intersection. Still, in order for the connectivity technology to be effective, a significant number of people will need to use it because vehicle-to-vehicle sensors work best when there's a critical mass of other vehicles to connect with. As a result, the report argues, a combination of vehicle and infrastructure connectivity along with vehicle sensors will be the safest and most cost-efficient way to persuade drivers to cede control of their vehicles. Even if the technology for self-driving vehicles is in place, widespread implementation may take some time as drivers grow accustomed to it. KPMG and CAR plotted three adoption scenarios: a rapidly aggressive adoption, a conservative estimate in which the technology doesn't catch on and a third scenario, which the groups believe is most likely. The report also looks at a variety of models examining how the changes in the vehicle would alter the auto industry. In the third scenario, the National Highway Traffic Safety Administration would release favorable regulations for self-driving vehicles, including ones that would significantly alter the way vehicles are tested and regulated. Other government incentives, such as access to special highway lanes, also would spur interest in self-driving vehicles. And early adopters would flock to the technology, according to the report. Still, in order for self-driving vehicles to make market inroads beyond early adopters, a viable aftermarket product will be needed to make existing vehicles driverless and reach the number of drivers necessary to make the vehicle-to-vehicle connectivity effective, Silberg says. "You would be willing, as a consumer, to pay for it because the advantage you see as you sit there in traffic while your next-door neighbors or friends are flying by at 60 or 70 miles per hour, not having to drive and they're reading their book or watching their movie," Silberg says. "We think that'll drive the aftermarket." Such a radical change in the way vehicles function will have untold consequences on the industry with the potential to upend the traditional automakers. "Who's the most smart at innovating will win a huge part of the market, in our view," Silberg says. "Why couldn't you have an Apple car? Why couldn't you have a Gucci car? Why couldn't you have a Wal-Mart car?" Traditional automakers could continue to manufacture the self-driving vehicles, but the report says they will need to adapt quickly and incorporate new technologies into the vehicles that consumers want. Because the cars will be automatically driven, the safety risks will be dramatically reduced, and as a result manufacturers will be able to produce new models on a much quicker basis -- much like cell phones and other consumer electronics today -- in part because, the report foresees, cars and trucks won't have to go through the rigorous safety testing currently required of all vehicles. Manufacturers, spared from the burden of today's regulatory tests, would be able to shift their focus to better integration of smartphones, tablets or other technology. In this model, the report proposes that manufacturing could be outsourced as nontraditional automakers begin to manufacture vehicles. Another model of how the industry might be altered suggests that the high-level of integration in the system, with the vehicle-to-vehicle and vehicle-to-infrastructure connectivity, will be a boon for data collectors to garner information about drivers. "A major player in the data market might not want to manufacture vehicles, but could well design a vehicle operating system," the report says. This type of system may raise privacy concerns that would need to be dealt with. Self-driving cars may also change vehicle ownership. Instead of every driver owning his or her own car, the report suggests that vehicle sharing programs may become more commonplace. Drivers will be able to schedule pickups because the cars drive themselves, and potentially, services would be offered at every price point -- from superluxury to no-frills. Ultimately, though, the researchers expect that some aspects of each of the models for a new auto industry will come true to some extent. "We actually think all the models in some level will occur, so it's not going to be one or the other," Silberg says. "I think all of the above, certainty they'll be a market for all of those. It's just who's the most innovative."